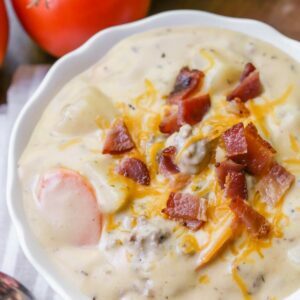 Filled with hamburger meat, carrots, potatoes, Velveeta, delicious spices, and BACON, this Crockpot Cheeseburger Soup is the perfect recipe for a cold day! Peel and chop your potatoes and carrots. Add both to a crock pot with broth. Cook on high for 3-4 hours, or until tender. Meanwhile, over the stove, melt 6 TB of butter in a skillet then add that and the 2 cans of evaporated milk into your pot. Cook your hamburger in the skillet with 2 TB of butter and add onion flakes. Once cooked, add to your crock pot along with seasonings and turn on low for at least an hour. Add velveta 30 minutes before serving. Top with bacon bits (optional). Enjoy!